It can be hard to be alone. I don't mean not being in a relationship. I mean just being by yourself. Chilling with yourself. Spending time not in dedicated company. I be alone a lot these days. As this post goes up (It's pre-written and scheduled.) I will be ending a weekend visiting with friends in Pennsylvania, driving with my young man to the Baltimore airport where he will board a plane home to Chicago and I will continue alone to my home in Virginia, where I will eat dinner alone. I might be a little sad, but only because I have just departed from the company of people I love, who I see infrequently. Generally, I am OK at being alone. I figure you have to enjoy life as it happens. My life right now involves a lot of being alone. Sure, I see people sometimes. I interact with people at work, with my roommates, with my classmates. Sometimes my fellow grad-school writers and I go out for Happy Hour. I've been into drawing tiny dinosaurs lately. 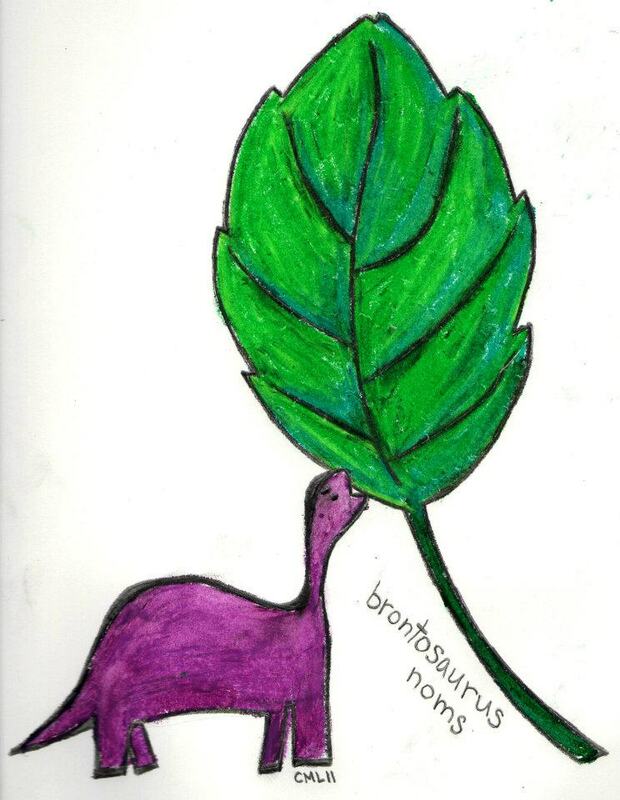 Yes, it is a tiny dinosaur eating a giant leaf. Some things I don't want to do by myself. But some things I am okay doing by myself. I go to cafes. Sometimes I go to bars. I go to downtown Alexandria and walk around. I go to First Friday in my town. I go to readings. I go to art galleries. I go to concerts. I have gotten dressed up and gone to a movie and dinner by myself. It's strangely liberating, and relaxing. And sometimes I just sit at home and draw, or make maps of fantasy lands, or tell myself stories. It's not that I don't like being around people—I like spending time with people I love. I like that very much. It's not that I don't miss people. I do. Very much. Enjoying solitude is not the same as not missing people. It's not about not missing people. It's not about not enjoying social activities. It's not about not wanting to engage in plans with others. It's about enjoying solitude as well as company. It's not just about not letting loneliness or boredom over power me, but about trying to enjoy solitude. Because solitude is a part of life too. Davis collaborated with filmmaker Andrea Dorfman to make a video of the poem in its entirety. Enjoy. How do you enjoy being alone?